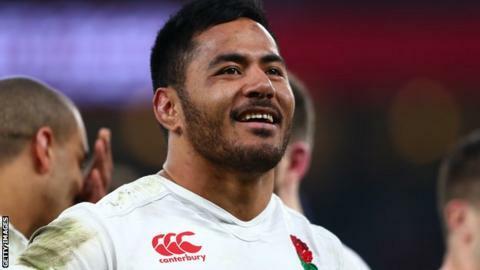 England centre Manu Tuilagi has not agreed to join Racing 92 next season and remains in negotiations over a new deal with Leicester Tigers, reports BBC Radio Leicester. The 27-year-old is out of contract in the summer and has been heavily linked with a move to the French Top 14 club. Tuilagi is in the England side to face Wales in the Six Nations on Saturday. Head coach Eddie Jones said the England set-up had been having "fun" with Tuilagi over the rumours. "As long as he doesn't get on the Eurostar between now and Saturday, we'll be all right" Jones told BBC Radio 5 live. "We just have fun about it," he added. "Give him baguettes, croissants, wear berets. Good fun. "Every player has a family situation they have got to look after and I want them to look after their families." Tigers are eager to keep hold of academy graduate Tuilagi, while any move would also potentially make him unavailable for this autumn's World Cup because of the England policy of ignoring players based overseas. He has been plagued by injuries in recent seasons, and his appearance against Ireland in Dublin last month was his first Six Nations start since 2013. Jones added: "He's in our family at the moment and we want him to play well for us - that is our only concern right now. "He's a massively important part of our team. The guys like playing with him, they love him."